Wanna buy some fake moon dirt? Off Planet Research, which manufactures loads of the stuff, is making it available for public consumption — but make sure you don’t eat it or breathe it in. The research facility in Lacey, Wash., specializes in making types of soil that simulate what’s found on the lunar surface. 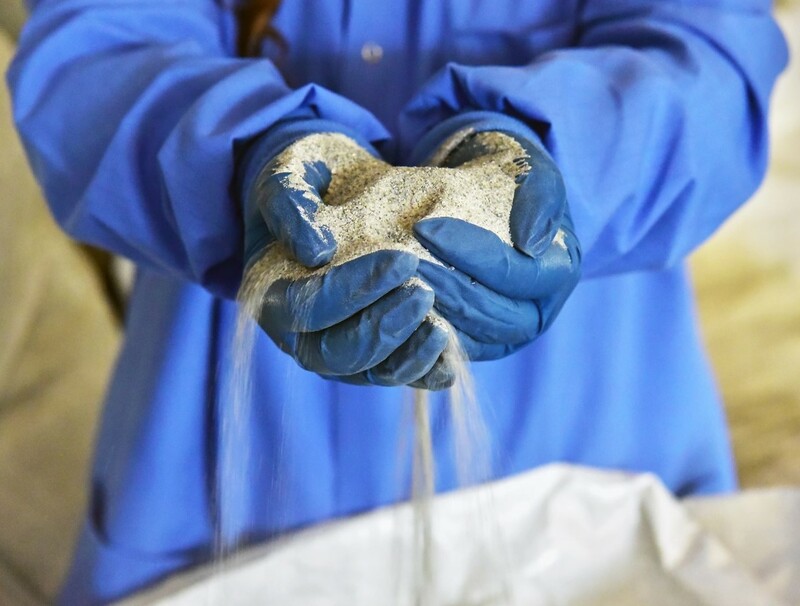 Off Planet mixes up blends of earthly ingredients, including crushed rock, so that students and scientists can learn how humans and their hardware would fare in the lunar environment. Two main varieties of lunar simulants are on the menu: a dark-colored blend that reflects the composition of the lunar lowlands, or maria, and a lighter-colored type of soil that mimics the moon’s highlands. Off Planet also makes a frosty concoction that blends water ice and soil, based on findings from NASA’s LCROSS impact experiment. That simulant, OPRFLCROSS1, can be used to test equipment designed to extract water on the moon. To ensure quality control, Off Planet typically rents its soil rather than selling it. Institutional users pay a monthly charge of $50 to $300 per kilogram, depending on the type of simulant, said Lauren Roux, one of the company’s researchers. “We expect the material to come back,” she told GeekWire. The European Space Agency is Off Planet’s biggest customer. “ESA has quite a bit of our simulant that they’re running through,” Roux said. Now the company is giving out limited quantities of its simulants as rewards for Indiegogo contributions. For as little as $99, contributors can get a vial of simulant, with their choice of lowland or highland dirt, plus a T-shirt. This entry was posted in GeekWire and tagged Moon, Off Planet Research, Space. Bookmark the permalink.